This Combo comes with a FREE PX4 Storm Pistol!! The Umarex 850 Air Magnum, features a 8 shot bolt action magazine system making this perfect for pest control, allowing for a quick second shot with the added benefit of a double push button automatic safety. Powered by a large 88g CO2 cartridge which is hidden under the front part of the stock powers this air rifle towards the legal limit mark allowing you to shoot out towards 35 yards. The major benefit of CO2 is the recoiless action which will help increase you accuracy, while the supplied moderator will reduce the muzzle noise down to a whisper in the field. This is all wrapped up within an attractive and hard wearing black tactical stock, with a removable forward section for the CO2 capsule which has a moulded weaver rail allowing you to mount a bipod. 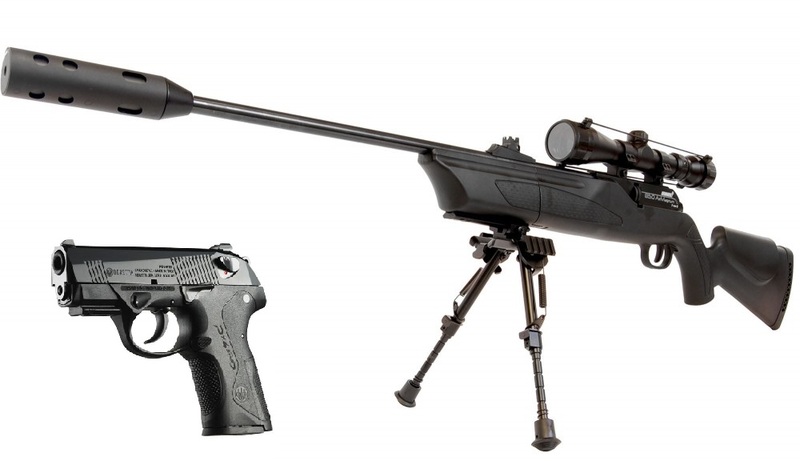 The kit includes Walther 3-9x40 Scope which is premounted and zero'd in house, a weaver mounted bipod and sound moderator..
From Umarex come sthe 1/1 scale replica air pistol px4 storm beretta. A co2 powered pistol that will fire both .177 bbs and 4.5mm pellets from its 16 shot magazine. Semi auto firing means that you can fire as quick as you can pull the trigger and with a simple and easy to load rotary magazine at each end of the magazine stick makes shooting a joy. Weaver rail situated beneath the barrel for fitting of laser sight or torch just like the real thing. Blowback action and a real kick feel to it ensuring this pistol is as close to the real thing as possible.